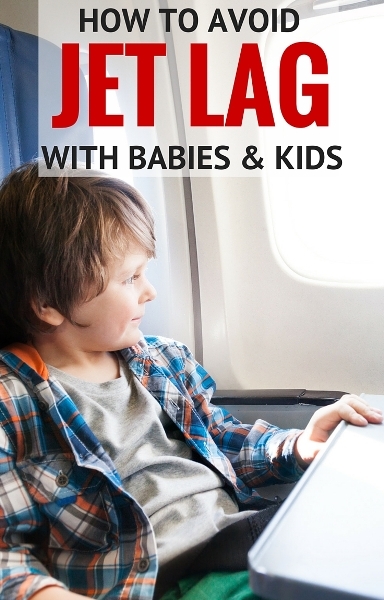 13 Tips for avoiding Baby Jet Lag, Toddler Jet Lag and Jet Lag in Kids! You’ve decided that you’re up for a long flight with your babies, toddlers and kids, but what about when you arrive? Will you have to deal with jet lag? We’ve all dealt with long, sleepless nights with our kids, especially when they are babies and toddlers. I’m dealing with a huge dose right now with a tiny newborn. The idea of having these problems at the start of a holiday while dealing with your own tiredness can be enough to question if it’s worth going away at all. I want to start this article by saying that we have flown a lot with our kids. We have visited Europe, the US and the Caribbean all the way from Australia and we have coped just fine. Just flying across our own country can give us a three hour time zone change. 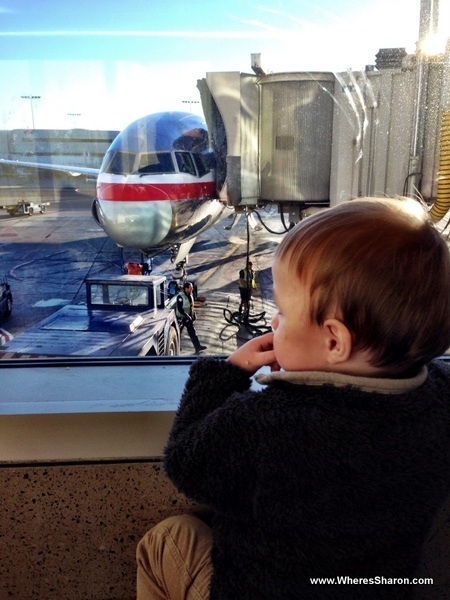 With all this flying, we have only ever had one problem with toddler jet lag. And we had another experience that wasn’t so bad, but we definitely were able to learn from (and so can you, keep reading!). Otherwise, we have not had any problems with jet lag and children at all. So don’t assume you will have problems with jet lag and kids – you may be fine. 1 What is jet lag? 2.2 2. Be tough: Fight through that first day! 2.6 6. Avoid starting a trip in a place with very long days/nights if you can! 3.5 13. Do you need to adapt to the new time zone at all? If you travelled much before kids, you probably know jet lag all too well. It’s not just being tired but the feeling that everything is out of whack. I find it makes me feel faint, light headed, exhausted and I struggle to eat much. Obviously, jet lag in babies and toddlers can be even harder for them to deal with as they can’t identify what is wrong or talk to you about it. The good news is that we have found that everything we would do as adults to avoid jet lag works well for kids too! There is no one time fits best option for the best flight time to avoid jet lag in children. I have heard a lot of people recommend flying at night so you can arrive fresh in your destination in the morning with plenty of daylight to help you all adjust. This might work great if you have kids that will sleep well on a plane. However, that does not work best for our kids. If you have kids like ours that struggle to sleep on a plane much at all, no matter what time the flight is, then I recommend flights which arrive at night time. I also struggle to sleep on planes and all four of us find it easier when we arrive somewhere that is already dark and we can go straight to bed. Usually, we wake up nice and fresh to start the next day with very few problems with jet lag. My recommendation here is to think about your own children, how good they are at sleeping in different places and work out when the best time to arrive might be based on this. Always alter any jet lag tip (or any other tip actually!) so that it will best suit your family. You know them better than anyone else. 2. Be tough: Fight through that first day! In my experience, how you handle the first 24 hours of arriving in a new time zone sets the scene for how quickly you will be able to shake the symptoms. No matter how hard it is, you have to adapt to your new time zone from the beginning. If you arrive during the day, that means getting out there. Ideally spend time outdoors – the sun should help. Find something fun to do that you will all enjoy and will distract you from tiredness. Eat meals at the appropriate times. Do everything you can to have a normal day in the new timezone. We do cheat on this sometimes and have a nap – if we are all exhausted after a long flight, we find this essential especially when we had babies and toddlers that still needed naps. Set an alarm though – multiple if you can! And don’t sleep for more than a few hours and give yourself plenty of time to get back out and about so you will sleep well that night. People always talk about adapting to the new time zone on the plane, and airlines generally try to help you with this. However, I would put some caveats with this when talking about flying with young kids. They still need to nap and eat and don’t understand or are unable to wait an extra 4 hours to have a meal. So I aim for the new timezone or as close as I can. Often this ends up being about halfway between my old and new time zones for flights to places like South East Asia where the time difference is usually 3-4 hours. 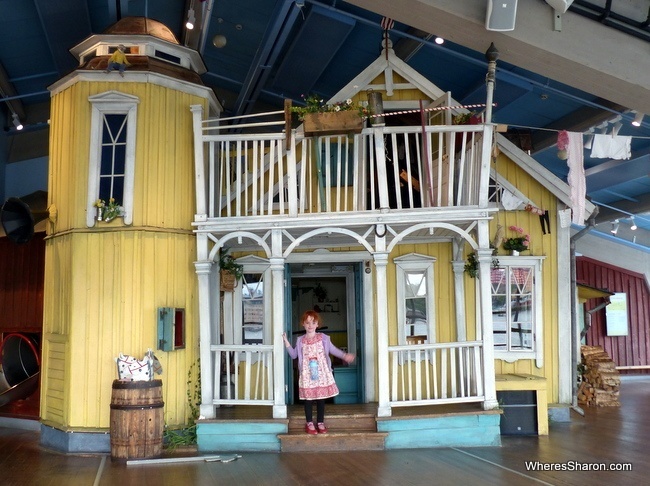 No doubt these things get easier as your kids grow older but toddlers and young kids can only tolerate so much – and we find travel is only fun when we are all well rested and fed. This is more a tip for those of us that live places like Australia and are crazy enough to fly to places like the Caribbean or Europe which take seemingly forever. With myself and kids that barely sleep on a plane, going all this way in one go is a nightmare idea. It is much easier, and we cope much better, if we break up the journey, even with just a one night stop. I find it much easier to cope on a 15 hour flight if I know we have a bed at the other end and not another 6 hours on a plane. 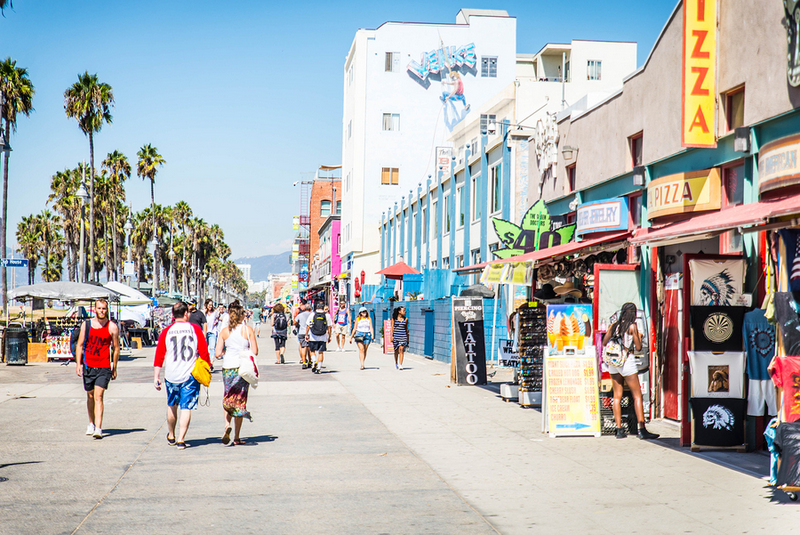 You can read about our 23 hour stopover in LA on the way to Miami. If the stopover is short, I aim for trying to adapt to the end point time zone if possible. Sometimes flight times can make that tricky though and I would pick well rested, young kids before a longer flight than ones who have adjusted to a future time zone. If you’ve been in a new destination all day after a long flight and you’re all exhausted, doing things like heading out for dinner can be disastrous with young ones. Treat yourself to room service or eat in the hotel restaurant – do whatever you can to make things easier, while not giving in the temptation to go to bed too early. You should also factor it into your travel planning. 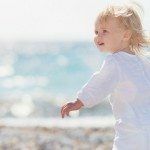 While I definitely recommend getting out and about straight away to help with any possible jet lag in toddlers, you should also take into account that some activities might be too much – keep the full on day trips for later in your trip. If you have multiple children, particularly ones at different ages (like a baby and an older kid), then try to stay in an apartment style or connecting rooms to start with. 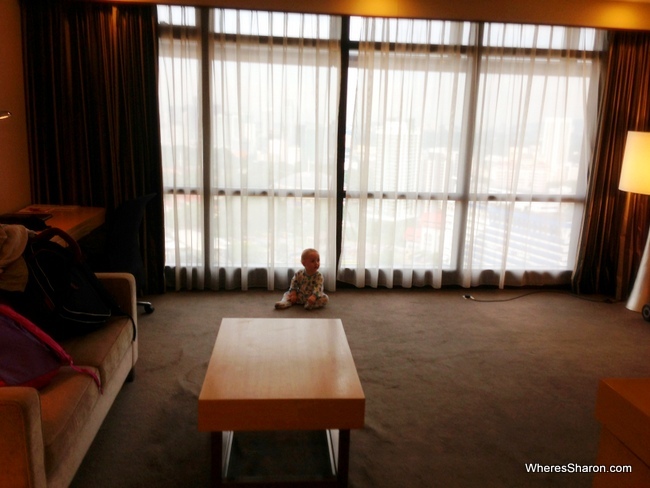 It is much easier to deal with a baby with jet lag if not everyone in the family is affected. 6. Avoid starting a trip in a place with very long days/nights if you can! This is a mistake we made last year without even thinking about it beforehand. 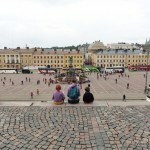 We flew from Bangkok to Stockholm in the middle of June – right before their longest day of the year. It was not ideal to take a long journey with a time zone leap finishing somewhere where it didn’t really get dark and night was very short. I didn’t find that we had problems with children and jet lag, but it did increase our tiredness, especially when our kids were up at 3am and we were having to argue with them that it really was night time – they didn’t believe us! We have found from two years old our kids start having some understanding of different time zones and what that can mean. Explaining it to them is not only educational, but helps them understand and adapt to what is going on – I suggest you do this well in advance. If you are going to be doing something like I describe above, ie flying into Scandinavia just before the longest day of the year, then talk about this with your kids beforehand too. We may have been able to avoid some very annoying 3am conversations about how it was really nighttime even though it was very sunny if our kids had understood how some places have very long days. If your kids are wide awake in the middle of the night, it can be better to just ride with it – at least for an hour or so – before trying to get them back to sleep. Have something for them to do, preferably something quiet if you are not all awake. iPads can work well for this. Or a book for older children. Make sure you have some snacks and drinks available just in case. In fact, I would always recommend this even if you aren’t worried about kids and jet lag. Do babies get jet lag? Yes, of course. They have body clocks as well, although for very young babies you will probably find problems are minimal since they are used to being up frequently night and day. It can also be harder to avoid babies and jet lag since they can be harder to keep awake, and sleep and drink often. There is also a massive difference between an 11 month old and a 1 month old baby – their needs and the differences between how they handle night and day is quite different. Here’s some baby jet lag solutions. Unfortunately, there is no easy one size fits all jet lag baby remedies. I have found changing my baby’s and toddler’s routines while travelling to work quite well. You just need to put some thought into it. This can also help with avoiding jet lag for babies. I often add another nap for babies and young toddlers. This way we can go out a little bit later in the evening. It also has the affect that I find they are better able to stay asleep in the new time zone at night as they are a bit more tired. Like at home, I wouldn’t let the naps go for too long during the day. I do recommend keeping as much as possible to be like it is at home though. For example, we keep the same night time routine. This is a great way to let your baby know it’s time for bed. Between the travel, your own tiredness and other children, it may be hard to put in extra effort to entertain your baby during the day, but this can also be a way to help them adapt to the new timezone. The thing that you most want to avoid is your baby sleeping more during the day and then not being tired at night. It’s time to go back to the advice you probably heard when your baby was born – sleep when the baby sleeps, at least at night time. Go to sleep when your baby does, even that’s at 7pm, so when they wake during the night, you are far better able to handle it and it will have less impact on your vacation. Do what you can to not let any baby jet lag symptoms get to you. If you find you can’t avoid being awake an extra few hours at night then embrace them. Find something useful you can do and then enjoy a nap the next day when the baby sleeps. 13. Do you need to adapt to the new time zone at all? Finally, it’s worth questioning whether you even need to adapt to the new time zone. If the time difference isn’t that big and you aren’t away for long, then there may be no reason to. If this is the case, just be well prepared for any problems it might cause – like stock up on food if you will need to eat breakfast at 5am – and go with it. This will help avoid baby and jet lag too. Big thick curtains can help! So the worst has happened and you are dealing with a jet lagged baby, looking for toddler jet lag solutions or just have a very grumpy kid. First things first. Take a deep breath! It will end. 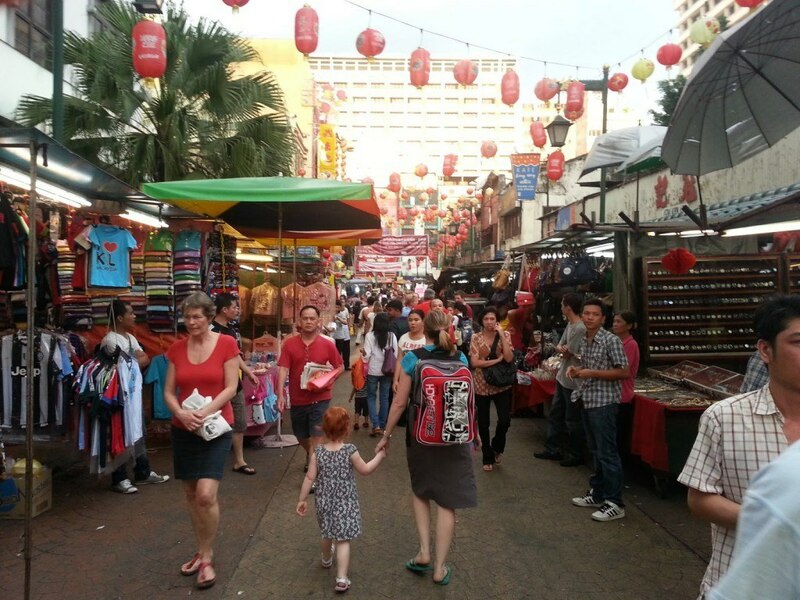 They will get used to the timezone and then you will be able to enjoy your trip. Dealing with any type of problem on arrival is always the worst since us parents are likely to be exhausted too. All you can really do is try to keep to the new timezone and keep edging them towards adapting as quick as possible. Try to not let them nap too long during the day and put them to bed at a normal time. Stick to meal times in local time zones and try to just keep to snacks at other times if they are hungry. It’s hard but try to get out and about. The one big problem we had was after flying from the East to West coasts of the US. 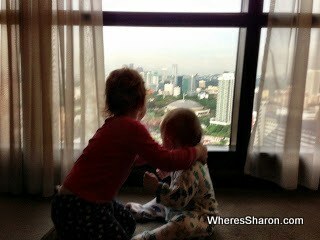 Our jet lagged toddler kept waking up about 3am and crying for a couple of hours. It was hard! We had to change accommodation too as he was disturbing everyone around us which was causing us more stress than it was worth. I honestly don’t know what we could have done to avoid it – we did nothing different than all our other trips where we never had this problem. Sometimes, you just strike the jackpot! Just ride with it and do the best you can. The toddler’s jet lag finished after a few nights. Of course, you are also likely to hit jet lag problems when returning home – although I find any type of problem is soooo much easier to deal with once you are in your own home. I suggest following all the same tips as above and try not to rush straight back to work/school/etc if you can. You all need some time to recover after a long trip and to help ensure you get over any kids’ jet lag as fast as possible and without the stress of a strict routine. 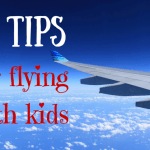 You can also read our best tips for flying with babies, toddlers and kids. You can find all our best travel tip posts here. Have you had any problems with jet lag and babies, toddlers and kids? What’s your best tip? 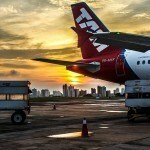 25 Tips for how to find the Cheapest Flights to Anywhere! 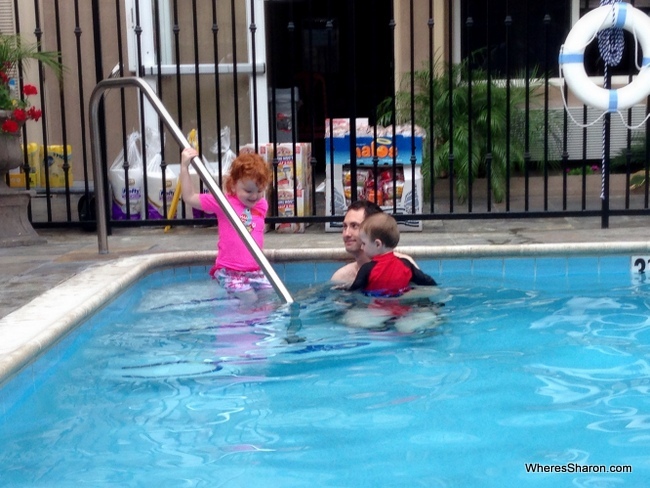 40 Things we have learned about Family Travel! 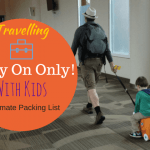 Family Packing List – Carry On Only! Thanks for the tips! Taking our 2 and 4 year old on the 10 hr trip to London next week, and was looking for some tips on dealing with the time change. We’ve traveled a ton with our kids, since they were tiny (from Canada to Africa, Australia, Asia etc). We have consistently found jet lag and adjustment much worse returning home (even though the conventional wisdom is that it’s worse going east vs west). At the start of a trip there is so much to do and experience, so we just flow with it. Home – not so much! How annoying although better than it ruining your holiday! Do you have any tips?